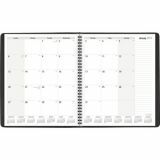 Notetaker Monthly Planner covers 13 months from January - January to keep you organized all year long and into the next year. One month per two page spread features open scheduling flexibility and large, unruled daily blocks give you plenty of space to plan your schedule. Monthly display features large ruled section on right hand page that provides room for jotting down quick notes and important information throughout the month. Past, current and 12 future month reference calendar along the bottom of monthly two page spread. Note: A minimum quantity of 9 must be ordered, and in units of 3 thereafter. 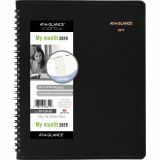 At-A-Glance Notetaker Monthly Planner - This Notetaker Monthly Planner will keep your notes and schedule in one place for enhanced productivity all year long. Large note section makes it easy to write down and organize important notes and keep monthly schedule near at hand. 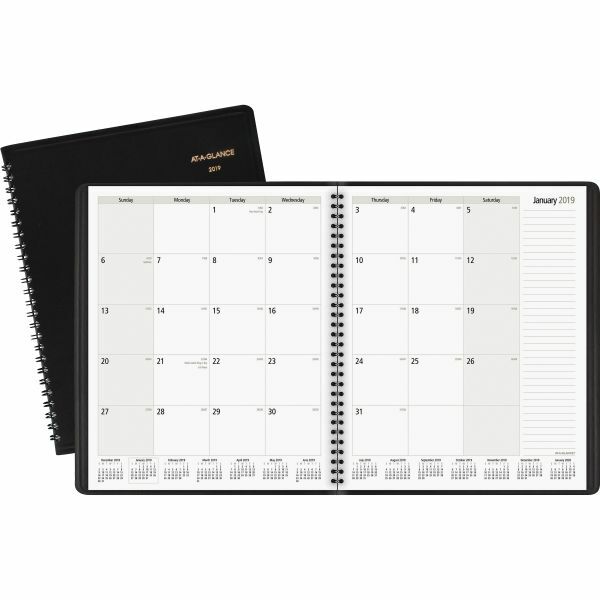 Professional note-taker planner ranges 13 months from January to January with two-page-per-month spreads. Includes past, current, and 12 future months reference on each spread and 96 note pages with yearly reference calendar. 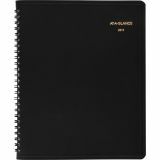 Large 96 page ruled note section add extra notetaking power to this planner. 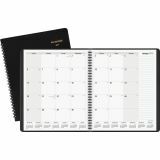 Note pages features yearly reference calendar along the bottom of each two page spread and date column along left margins of each page to help chronicle important entrees. 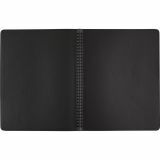 Notetaker Monthly Planner is printed on premium quality paper containing 30% post-consumer recycled material paper that resists ink bleed. Classic black and white design features important dates and holidays in contrasting red ink for easier scheduling. Smart looking professional one piece cover with wirebound binding for durability. Page size is 9" x 11" and the overall size is 9 5/8" x 11 3/8" x 5/8".